The first time my husband and I visited Milan, we had no idea where to eat dinner. We knew we wanted to taste northern specialties like risotto, veal chop Milanese-style, and polenta, but since we were so tired, we chose a restaurant near the train station. It was called La Porta Rossa (The Red Door). One look at the menu told me that seafood, southern style, was the specialty, and that the establishment was owned by Pugliese. Puglia is the region at the heel of the Italian boot, and Esposito is a very common name there. When the cameriere saw our last name on my credit card, it was as if we were long-lost relatives of the owners. They gave us ceramic pitchers to take home and newspapers about Puglia as well as a bagful of taralli, honey-and-anise-flavored cookies that look like miniature bagels. When we went back the following evening, we were welcomed as family and given another bag of taralli; I asked how they were made and this is what I came away with. In a large bowl, beat the eggs with a whisk. Slowly add the honey, whisking constantly. Gradually whisk in the oil and whisk for 2 to 3 minutes longer. Then add the anise extract and anise seeds and mix well. Add the flour 1 cup at a time, and mix until a ball of dough is formed. The dough will be sticky. Turn the dough out onto a floured surface and knead for 10 minutes. With floured hands, pinch off pieces of dough the size of golf balls and roll them into ropes 6 inches long and the width of your middle finger. Pinch the ends of each roll together to form a ring. Place the taralli on kitchen towels as you form them. In a large pot of boiling water, cook the taralli in batches: Drop the rings a few at a time into the water and boil for 5 minutes after they have returned to the surface. (They will look a little wrinkled at this point, but will smooth out as they bake.) Remove the taralli with a slotted spoon and place them on clean towels. Let stand for 30 minutes. Preheat the oven to 425ºF. Lightly grease 2 cookie sheets. Place the rings 1/2 inch apart on the baking sheets and bake for 20 minutes, or until lightly browned. Transfer to wire racks to cool. 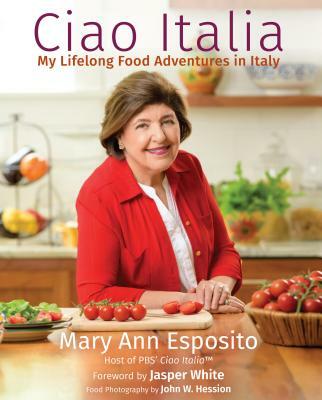 This recipe is from CIAO ITALIA by Mary Ann Esposito, published by William Morrow and Company Inc., in 1991. Thank you for posting the taralli recipe. I have eaten them since I was a child but my family never made them. I buy bags at the local Italian grocery stores and wanted to make them at home. I found your recipe for black pepper taralli in 'Celebrations Italian Style' but i really prefer anise, plain or other flavors!